Inside Higher Ed is an online news source that deals with higher education. In addition to the job postings and university news items, they often publish essays and blogs from college professors about the trials and tribulations of life in academia. Yesterday they published an essay by Dr. Nate Kreuter entitled, "On Guns in My Classroom." What makes Dr. Kreuter's essay particularly relevant to me is that he is an Assistant Professor of English at Western Carolina University. This is the same university at which I earned my master's degree and at which I teach as an adjunct instructor in the College of Business. 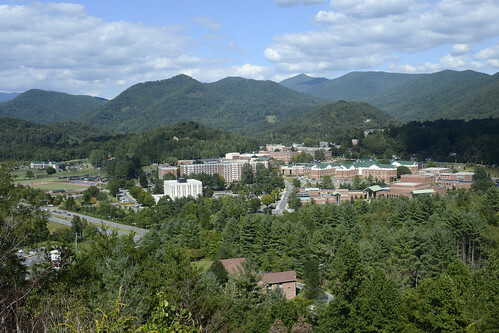 As you can see from the photo above, WCU is nestled in a valley in the Great Smoky Mountains in a rather idyllic setting. While a bit isolated, it still can see its share of crime. There have been rapes on campus and there have been assaults. Indeed, in my university email this morning I received a notice from the University Police of a burglary of an occupied dorm room. Under North Carolina law that constitutes first-degree burglary which formerly was a capital crime. So what is causing Dr. Kreuter to lose sleep? Is it about his effectiveness as a teacher and whether his students are actually learning? Is it about whether or not he will get tenure in a few years? Is it the fear that he won't be able to protect his students if a mass shooter wants to perpetuate another Virginia Tech type massacre? No. What is causing Dr. Kreuter to lose sleep and to write an angst filled essay is the mere thought that the North Carolina General Assembly might approve legislation allowing concealed carry on campus for students, staff, and faculty. Nevermind that the General Assembly has never had such a bill come before them and nevermind that it is still a felony under North Carolina law to merely even possess a firearm on campus unless you are law enforcement. Then, among many other things, I wondered what I would do if the state allows guns on university campuses. The idle fantasy of quitting one’s job is normal and healthy and sometimes even savory. That’s what I’ll do, I thought. If the state lets students carry guns onto campus I’ll just quit. It’s that simple. I’ll just quit. The hell with it. I’m not living that way. I could quit and feel principled and self-righteous. Nobody depends on me. I don’t even have a dog. I could just quit. The Boarder (his cat) would be fine, and any number of ex-girlfriends have made clear that while I am no longer welcome, they would be happy to have him back in their lives at any time. He is the more charming of our pair, and he and I both know it. I could pawn him off, sell what little I own, and live on nothing. I could drift. I have no delusions. It won’t matter if I quit. A hundred applicants will line up for my job. And there is nothing easier for a politician to ignore or dismiss than the principled stand of a nobody constituent. But I will quit. I find his whole essay ludicrous and filled full of naive delusions. What makes it even worse is that Dr. Kreuter is a gun owner and writes in this essay about going grouse hunting. I've talked to some of my students at WCU about firearms and concealed carry. I don't include it in my lectures but if someone brings it up after class I don't shy away from the discussion. The students who brought up the topic were responsible and mature. It wasn't like they were going to shoot me or anyone else if I gave them a bad grade. Dr. Kreuter needs to grow up and realize that the real world can be a dangerous place. Moreover, that danger doesn't come from a properly licensed student or faculty member who has undergone training and a background check. Unfortunately, even at Western, I fear that Dr. Kreuter has many colleauges that feel as he does and not as I do. So he quits, they hire someone less stupid, and students are better off. Does he ever leave the campus grounds? Is he aware the only students who could carry around him on campus are the same students who might be carrying around him off campus already? Folks opposed to campus carry by anyone, if you read their comments closely, seem to believe that suddenly new people will arrive bearing arms. They don't quite get that it's the same folks: teachers, students, what have you, that they deal with daily, presumably comfortably, now. A friend of mine works on a campus in Toronto, Ontario. Legal CCW is impossible, yet armed criminals are common. Every day, she receives a print-out of the assaults, robberies, muggings occurring on campus the day before. In legal-gun and self-defense-hating Toronto, you call 911 and wait, and every criminal knows this. Perhaps the professor would like to apply for a teaching position in this gun-free zone. Think of how safe he will feel. Dr. Kreuter comes across as a bed wetting pansy who will never grow up to live in the real world. It's not surprising that he can't maintain a relationship with a woman. What self-respecting woman would want such a wimp. It is sad that he is in ANY position to influence young people. It wouldn't surprise me if he uses his position to bully students into acquiescing to his ill-developed world view, at least while they are in his sphere of control. The world would be a better place if people like him would, as he threatens, quit. It would be NO loss to anyone to have fewer like him in positions of authority. I hope that none of his students allow him in any way to intimidate them into giving up any of their rights to satisfy his emotional and intellectual shortcomings. The collegial thing to do at a university would be to meet Nate and have dialogue, rather than blasting him and making him a target. You would have learned a lot in reaching out to Nate. Five minutes with Nate would show you that he's a contender. He's an intellectual force and a legit outdoorsman. Five minutes you would probably have decided you actually like him and would want to be his friend. But instead, you choose without any real context or information (except that he has a position you disagree with) to attack his character. Since I know Nate, I can say that I think you made a bad choice here. And one that a university employee should really reconsider. That is, you always have the choice to take the post down, and have that meeting. You'd be very lucky, if Nate would consider it. Keep in mind, John, that Nate is responding to the actual requests, by a sizable portion of the American population, to arm teachers, if not also students, and to abandon gun-free zones -- all in the wake of actual tragedies. Whether it's very likely that legislation in his state changes, that they permit students to conceal carry in his classroom, is almost beside the point. He's not inventing an occasion to discuss guns in the college classroom; he’s not the only professor concerned about this issue. So, maybe you should address the substance of his argument, at which you take only the most haphazard of, um, potshots, and some very anecdotal ones at that. For instance, who cares that your "students who brought up the topic were responsible and mature"? Are they experts? Are they teachers? However, I most take issue with your assertion that "Dr. Kreuter needs to grow up and realize that the real world can be a dangerous place." I'd bet you 100 clams that this is the premise on which Nate's entire argument is founded. It's certainly the premise on which my entire argument against armed classrooms is founded, as I'll explain. Uncertainty is what these killers thrive on -- they walk into a crowded room, filled with unsuspecting innocents, and pull the trigger. And many of them welcome death. So, if an unhinged killer is shot to death by a first responder, after killing ten (instead of twenty) victims, do we rate this outcome a success? I don't. In fact, I don't rate this a very plausible scenario either. 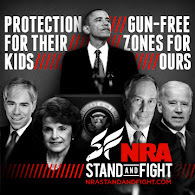 Are these killers drawn to gun-free zones? Probably. Will arming students make a difference in some of these situations? Maybe, and if so, probably only by reducing the casualties, NOT by entirely preventing them. Remember, the killers thrive on uncertainty (e.g., the element of surprise) as much as they thrive on unarmed innocents. Remember also that unless you live in fear, your gun drawn ready for action, then you are an unsuspecting innocent. But the situation's uncertainty hasn't much changed; you're just an armed unsuspecting innocent. And isn't it true that the student shooting someone today was sitting in class yesterday, by most appearances a good student, at the very least a non-killer? You'll answer no, if, like Ted Nugent, you believe these killers are "evil" -- as he wrote about Virginia Tech's Seung-Hui Cho. Perhaps, then, we just need to build a machine that detects the evil among us . . . instead of regulating the machines with which the killers are mowing down innocent people. Does it make me feel safer to have a room full of today's non-killers armed for tomorrow's killers, the line between the former and latter so very...uncertain? No. Do I believe the machines with which today's killers are mowing down today's innocents are part of the problem? Yes. Can we actually fix this part of the problem, with some certainty of success in reducing and in some case preventing death? Maybe. But should this "maybe" discourage us from trying to fix the problem -- specifically, from (1) banning all weapons from certain places and (2) banning certain weapons from all places? No, we should not be discouraged, because we don't yet know, with any certainty, whether such bans will AUGMENT the problem. Until we know for sure, and because I can't predict with any great certainty whether the innocent today won’t be the killer tomorrow, I prefer a room full of students over a room full of fearful, paranoid, and perpetually threatened young people with guns. Who knows, maybe in this student-armed context one student offends another one. Or maybe someone knocks over a desk and throws a punch. Or maybe I slip up and make the mistake of saying I think they shouldn't have these guns in class. And who knows, maybe then something uncertain could happen. It’s a dangerous world.